QUEENS — A woman was killed and seven children were taken to the hospital following a three-vehicle collision in South Ozone Park Tuesday morning, according to the NYPD. 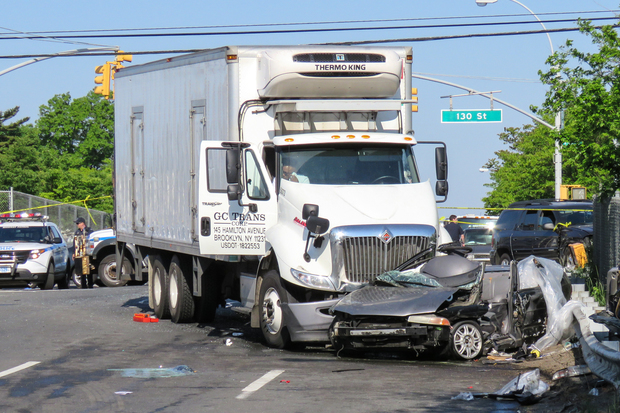 A GMC Envoy SUV carrying seven New York City public school students was traveling south on 130th Street near South Conduit Avenue at 7:20 a.m. Tuesday when it collided with a Chrysler sedan heading east on South Conduit Avenue, officials said. The impact sent the Chrysler spinning out of control and into the path of a white box truck also driving east on South Conduit, according to police. Passenger Carmen Gonzalez, 53, of Greenbush, New York was ejected from the front seat of the Chrysler and pinned beneath the front driver's side of the truck, police said. Gonzalez was rushed to Jamaica Hospital where she was pronounced dead, according to the NYPD. The driver of the Chrysler was transported to Jamaica Hospital in stable condition. The 55-year-old truck driver was treated at the scene. The seven kids in the SUV — which was not a Department of Education vehicle, according to the agency — who were between 7 and 12 years old, were all treated for minor injuries at Long Island Jewish Medical Center. The 53-year-old female driver of the SUV was also treated at Long Island Jewish for minor injuries. It was not immediately clear if any of the vehicles ran a stop light at the intersection, an NYPD spokesman said. There were no immediate charges filed against any of the drivers. Alcohol was not a factor in the accident, sources said. There was no answer at a number listed for GC Trans, the company whose decal was on the passenger door of the box truck. The NYPD’s Highway Collision Investigation Square will continue to look into the accident.